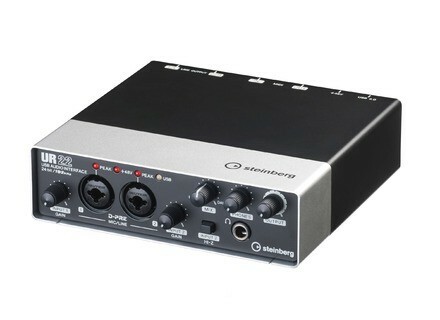 UR22, USB audio interface from Steinberg in the UR series. 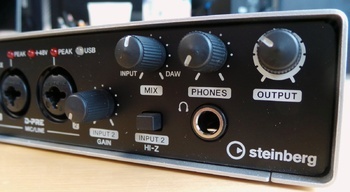 Product replaced by the Steinberg UR22mkII. Steinberg introduced the UR series a little over a year ago with the UR28M and the UR824. 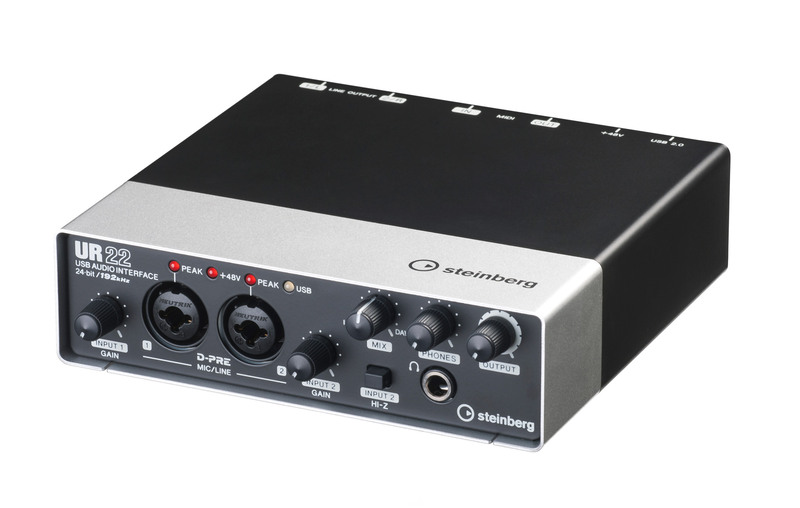 They’re back with an entry level unit priced at under $200 with two D-pre preamps included. Verdict? Ever since Yamaha purchased Steinberg, we have seen a flurry of products, software and hardware alike, integrating the new technologies stemming from the Japanese R&D department, such as AI (Advanced Integration, with some audio interfaces) or VCM (plug-ins RND Portico and Yamaha Vintage). 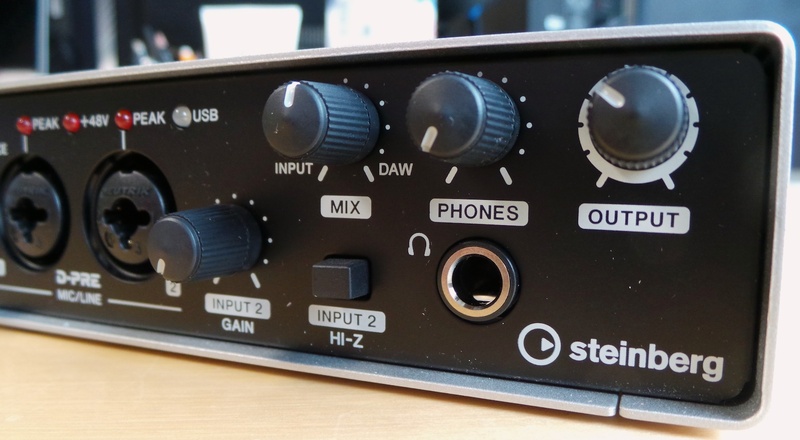 The small USB audio interface we’re testing today also integrates the D-pre preamp technology from Yamaha which is also used in the Steinberg UR audio interfaces and some Yamaha mixing tables. This should be good news, given the reports we’ve heard concerning these preamps in the last few months. We can’t really say that the UR22 is novel in its design or its functions. Its overall construction is “serious” with a metal chassis, reassuring weight (998 grams) and a "pro" look to it, with brushed black aluminum housing. The format is risk free with the very classic 1/3 rack unit. With all the new desktop format audio interfaces out today proposing knobs, buttons and switches, all placed under your fingertips, the UR22 comes across as a bit of a relic. But in the same price range, Presonus, Roland or Focusrite offer the same thing… which is not much! We liked the Konnekt 6 from TC Electronic which proposed something different and practical but only had one mic preamp! We can’t really say that the market for audio interfaces is undergoing an innovation boom... OK, end of rant. 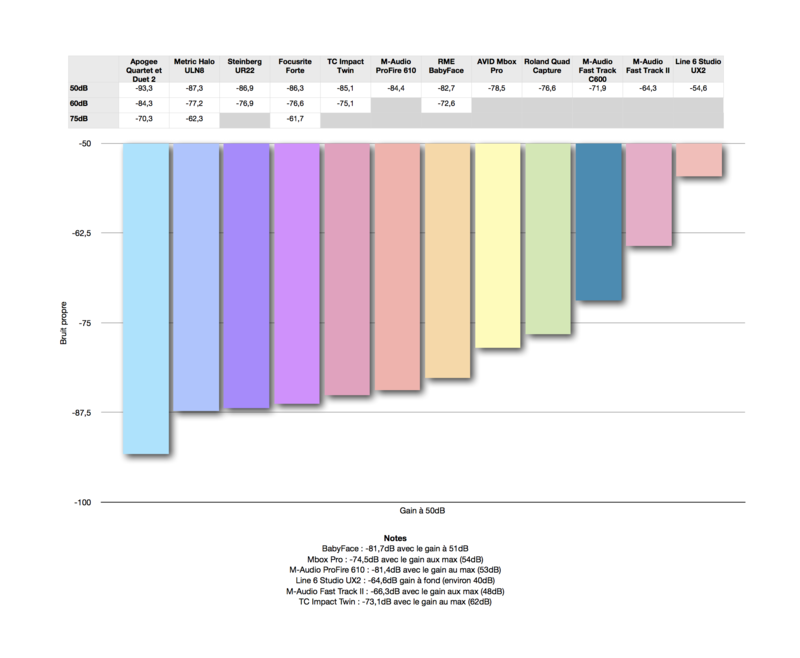 As far as functions go, no surprises here. Combo XLR/jack 6,35mm inputs (Neutrik, if you please), the two associated gain knobs (analogue, no digital controls, too bad), peak indicators, 48 Volts and USB. A knob that lets you mix the signal from your sequencer and the input signal, a switch to trigger Hi-Z mode (high impedance for electric guitar/bass), a headphone output with volume control, and a general volume knob which controls both outputs found on the back of the unit. These are 6,35 TRS symmetric jacks. In the "Return to the future" series we also find MIDI 5 pin DIN connectors, that some of us will be happy to find. With all the MIDI USB controllers invading the market, these DIN connectors are becoming more and more hard to find in these entry level audio interface products. Rounding these off is the switch for the 48V phantom for the two mic inputs at once. The installation went off without a hitch using our Mac, but we are slightly disappointed that Steinberg has included so few advanced integration options for its sequencer. The “auto-setup” function is front and center automatically assigning I/Os in Cubase… Yep, that’s right! There’s no real advantage to using this interface with Cubase, plus the competition offers the same functions as the UR22 in the German sequencer. It should be noted that the interface is boxed with Cubase AI 6 included (download version) and purchasers will be able to download 7 when available. The main limitations of this version, versus the complete version being: 32 audio tracks max. (48 MIDI), 4 inserts per track, 8 virtual instrument. HALion Sonic SE and 26 VST effects are included, enough for the beginning home studio enthusiast to keep busy. 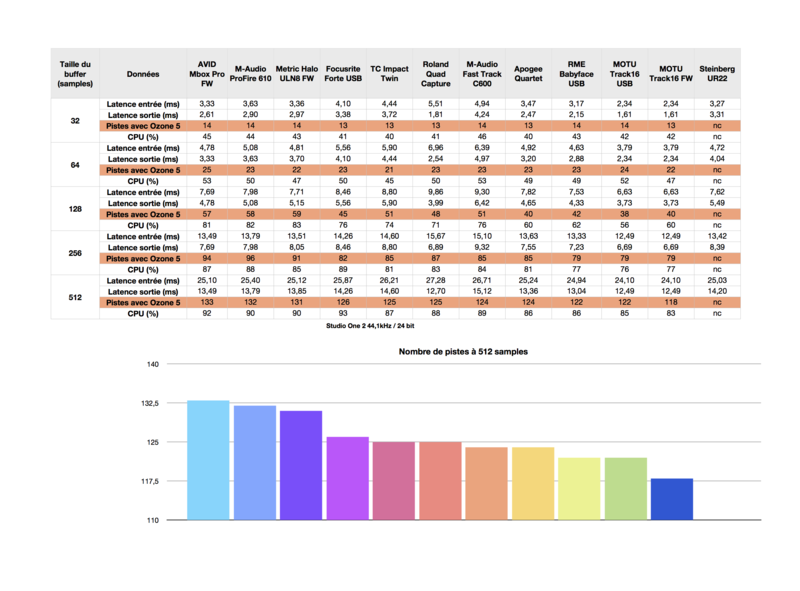 During tests, the interface proved stable with efficient drivers. Due to a recent computer change, we weren’t able to try the interface out with our library of drivers and, of course, our new machine (more power) came up with better results than the old one would have. The preamps offer a gain of up to 60dB, which is not bad for an interface in this price range, and background noise (even with gain full on) remained discreet. The D-Pre’s are definitely nice preamps and the fact that they are integrated in a unit in this price range (under $200) is good news. One more reassuring detail: for comparison purposes, we set the gain on our Metric Halo ULN-8 to 40dB (digital gain control). For the equivalent (more or less 0.1dB) input gain on the UR22, we only needed to turn the knob to its halfway position. It’s fairly linear, which is rare with these lower priced audio interfaces which usually have exponential curves when it comes to gain (the level increases quickly at the end of the curve with plenty of background noise!). Of course we would have preferred a digital gain control, but at this price….dream on. As for the converters (up to 192 kHz, which is more a sales pitch than anything else), we couldn’t really do our "loop back test", because the interface doesn’t have real line inputs, which is usually the case with entry level interfaces. In fact, looking over the schematics supplied by the maker, we can see that line in passes through the gain. So trust only your ears with the following example: we placed a mic in front of an acoustic guitar (a Gibson J-200), with a Y cable sending the signal to the UR22 and a ULN-8 from Metric Halo for reference scale. 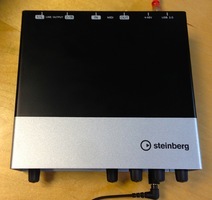 The little Steinberg does very good for $200 entry level unit! More than enough for UR22 purchasers to make demo’s with. 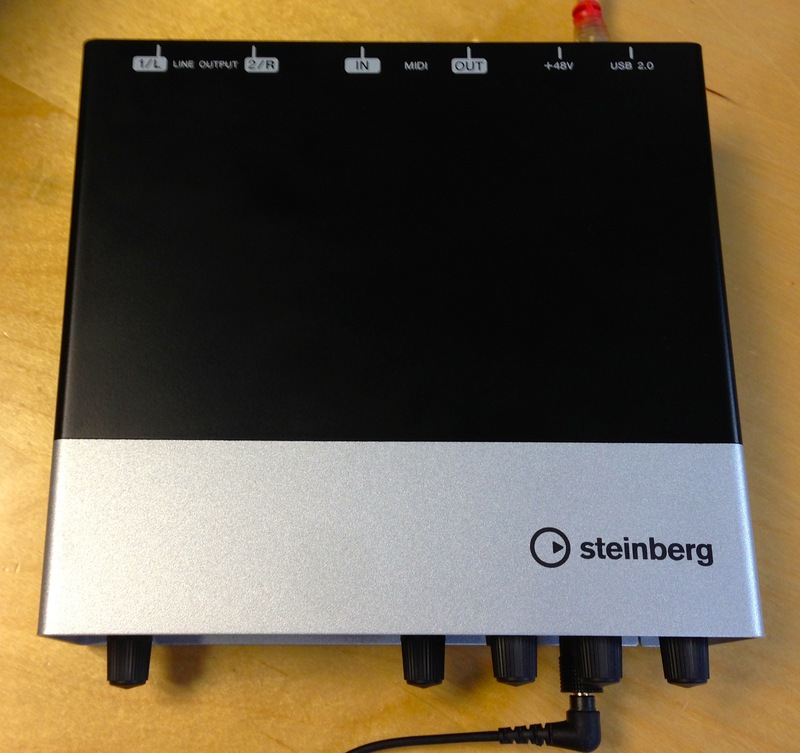 Without much risk, Steinberg introduces an audio interface which revolutionizes nothing, doesn’t do much, but does it well. The D-Pre preamps are clearly the high point of the UR22 : which offer sufficient gain for the majority of situations and very little background noise. We only regret that there are no real line inputs or, out of the ordinary, functions (auto-gain). Other than that, it’s sturdy and simple to use, which will please novices and nomads looking for an interface costing only $200 with two good mic preamps.